I just learned this by reading up on it a bit today. Prestige is xp given to you in your base xp for dungeoneering. It is kind of tricky to understand at first but this is what I grasped off it. Prestige is an xp given to you per floor you are doing. If you have done that floor already you will not get prestige xp the next time you do that floor, so you get his xp only once. The more floors you do the higher the xp will be given per floor done (not per higher floor number, its total floors.) It was set up this way so people didn’t grind the same floor over and over for XP. Method of getting max prestige xp. Start at floor one and work your way through the floors. You will get prestige xp per floor done. Upon reaching the highest numbered floor you can do (example lvl 6) go back out and using your ring reset it(you won’t lose floors unlocked or complexity.) Upon reseting go to floor one and work your way down again. This way you will get max xp from prestige and your base xp. This means more xp for ya. I hope this helps some. And if you have any questions i’ll try to answer them. Baba Yaga on Lunar Isle also has a few battlestaffs for sale, but check as you buy them as they start at 7k but rapidly increase in price. Remember your seal of passage! A time consuming way of getting them, but is cheaper than buying on GE while training up magic. Battlestaffs cost 1 Telekinetic, 2 Alchemy, 20 Enchantment and 2 Graveyard pizazz points. The Grand Exchange is a most convenient place to buy everything, but battlestaffs have a limit of 100 every 4 hours, if you are constantly crafting them you should try looking over the forums for people selling bulk amounts. You can get 84 sand a day from Bert in Yanille, resetting every 24 hours. They are delivered straight to your bank. The sandpit in Zanaris is the closest to a bank but not often used because of the random events in Zanaris which can slow you down. 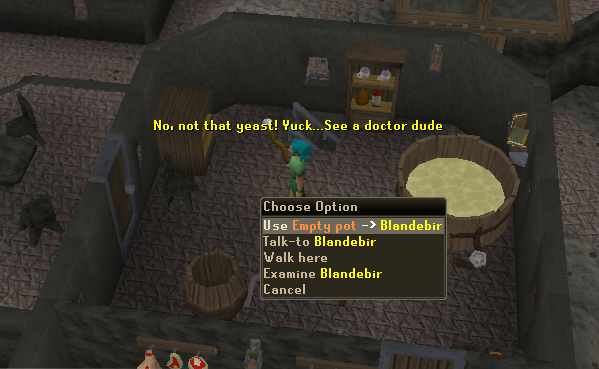 Many people prefer using the one in yanille. 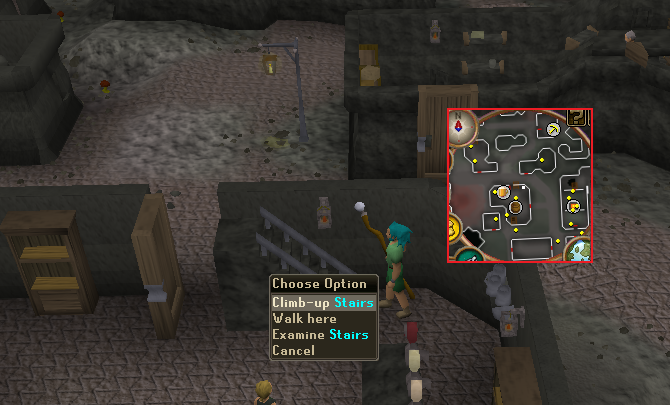 A way of gathering sand very quickly is to move you house to Yanille, get some house teleports and dueling rings. Teleport to your house, go out and fill up your buckets. Use a BoB too if you like. Once filled, teleport to Castle Wars to bank. Buckets of sand at the Grand Exchange has a limit of 10k every 4 hours. 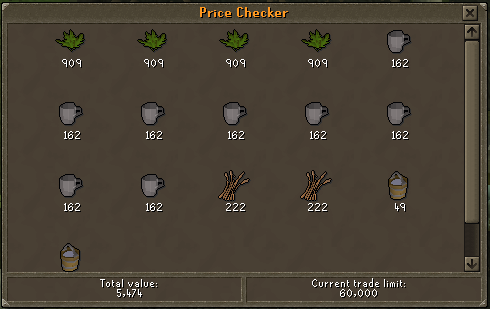 You can buy 80 (noted) seaweed from Arhein in Catherby for 2gp each, he only restocks 24 hours after you have bought the last of the seaweed. There are 2 nets that catch seaweed at the north-east corner of Piscatoris that respawn fairly quickly and is close to the bank. The best alternative for quest noobs people that can’t get into Piscatoris, because now there’s a deposit box at the Port Sarim docks! There are 8 spawn points at the North-west end of the island. No armour/weapons are allowed on Entrana, it’s easier just to wear wight-reducing items so you can run longer. 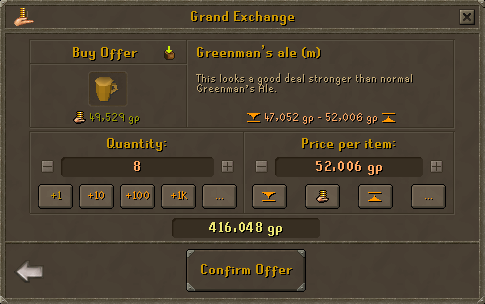 Seaweed at the Grand Exchange has a limit of 10k every 4 hours. Either buy them or craft them yourself. The Grand Exchange has a limit of 25k runes every 4 hours. Firstly, make sure you are on the Lunar spellbook. Grab an air staff, fire and astral runes for however many casts of Superglass Make you want. Withdraw 13 buckets of and and seaweed and cast. This gives you 130 crafting exp and 78 magic exp per inventory. the buckets will be destroyed but you will get an extra 0-10 molten glass per inventory (about 33% overall). Craft the glass into unpowered orbs with a glassblowing pipe (spawn at Entrana),giving 52.5 exp per orb. Then switch back to normal magic to enchant the orbs. Start at Edgeville. Equip an air staff, a charged glory and some light armour. Bring and 27 unpowered orbs and 81 cosmic runes (3x cosmics for each orb). Run to the air obelisk through Edgeville Dungeon and enchant. When finished, use your glory to teleport back to Edgeville. Using BoBs is recommended to charge more than 27 per glory charge, especially if you only have a few. You can either sell or alch the finished staves. Hello and welcome to my guide on brewing your own beer. I’ve found it to bring in a fair bit of money for very little effort. Once finished you sell these at the GE for max. They’re highly sought after by herbalists who don’t bother wasting their money training, or wasting their time raising their stats with evil stews. I’d time how long this task takes, but you could just take my word for it. If you take longer than 8mins all up you’re doing something wrong. You’ll also get cooking xp from this, a whole 281xp per brew. And you can do roughly one sometimes even two brew runs per week, 2 each run. Golly, imagine how much xp you’d get in a year!! Bottom line, you need to quest. So what’s this “stuff”, what makes them think it deserves a title like “The”? Why not “Mr Stuff”? Can I skip getting it? Sadly no you can’t. It’s obtained as a reward from the Trouble brewing mini game. In short annoy the group chat when there is greater that 6 people in it. I’m also assuming you’ve already got brews on, ready to be collected. If you don’t forget the glasses and it’s 4 barley malt, 4 buckets of water instead of 2. 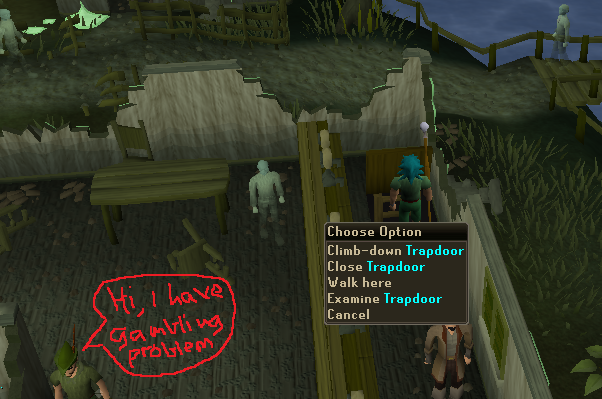 Start at the GE, along the west wall you’ll find a trap door. Go down and travel to Keldagrim. From where your cart docks, run north to the pub. First add the water, then the barley, THEN THE STUFF! Don’t skip this as you’ll have to drain it and start again. Next add the harralanders. Now you need yeast. Not feeling stupid bringing those coins now, eh? Add it finally and your brew will start to ferment. Use your pot on the dwarf again to refill your pot with yeast. Stop your dillydallying and use your ectophial to teleport to Port Phasmatys. Run south through the gate, then SE past the pub (unless it’s your first time) to the bank. Spam-click your way through pointless dialogue to open your bank account, take out another 2 barley malt, 8 glasses and run back NW to the pub. Go down to the trapdoor once there. First add the water, then …read the section above? For those who only have access to Port Phasmatys, well you only get half the profit. You’ll also need a Ghostspeak amulet and 10 ectotokens for yeast here? Step3: ???. Step 4: Profit! Each brew location you visit gets you 8 glasses or two kegs. 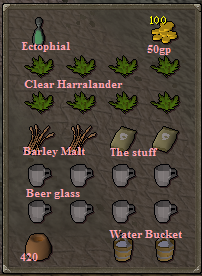 So you visit both Keldagrim and Port Phasmatys to get 16 glasses or 4 kegs. Remember you’re doing this twice. Mm, twice. Q. How long does the brew process take? A. Varies lots, and I’m positive that’s because the duration has been updated several times. Just check every 3-4days (I keep a reminder in my notes), if it’s not done after that check once a day until it is and then tell me how long it took you. Q. Will calquat kegs work just as well? A. Glasses for now still get a good profit. I’ve been keeping an eye on kegs and very soon they will be the way to go instead. Q. Where do you get supplies? Q. I looked at the GE graph and saw they crashed. A. That’s not a question. Follow the graph and you’ll notice they got bought back up again and are still rising. Sometimes they sell instantly for min, sometimes max. You really worried about losing 20k? A. Shut up merchant, and stop ruining my game.